When Will Airbnb Decide What Kind of Company It Wants to Be? In 2007, I got an email from San Francisco. A big industrial design conference was coming to town and Bay Area hotels were predictably overbooked and overpriced. Two designers wanted to help their friends find affordable, un-scary places to stay, so they started a website called AirBed & Breakfast. The two designers were Joe Gebbia and Brian Chesky, who came up with the idea after deciding to rent out part of their SOMA loft for the conference. And they were clearly onto something. Here, other designers could rent out their apartments, their rooms, or their couches to conference attendees—some of the hosts even threw in wifi, coffee, and cute welcome kits. Although CouchSurfing.org or VRBO.com were well-established at the time, this idea of a designer-to-designer marketplace actually sounded like a brilliant idea. Conference-attending designers could trust (for the most part) other designers to have (for the most part) similarly well-appointed homes, and those designers could trust (for the most part) that other designers would not trash the place. Plus, the design community is a small world, and the chances of hosts and guests having a friend in common were pretty good. I quickly wrote up the website for the design blog I was editing at the time, publishing one of the first stories on AirBed & Breakfast, or as we know it now, Airbnb. In the six years since, I've watched with admiration as Airbnb grew into one of the most successful startups on the planet. It's now valued at over $2 billion and lists properties in over 34,000 cities. But some of those cities have been friendlier than others. In my own L.A. neighborhood, the neighborhood council has introduced a motion to ban it outright, saying that Airbnb rentals create noise, traffic and parking issues, "bring transients" and hurt property values. In New York City last week, an appeals board reversed an earlier fine levied against an Airbnb host for operating an unlicensed hotel (this was the same case where a judge declared Airbnb illegal in May). And on Friday, the New York State attorney general issued a subpoena demanding user data of Airbnb hosts, a motion that Airbnb says they're fighting to protect user privacy. These recent developments prompted Airbnb co-founder Chesky to write "Who we are, what we stand for" on the Airbnb blog last week. It reads like a manifesto. In the statement, he proposes some pretty sweeping promises: new legislation that makes home rentals more clear, a neighbor hotline to deal with complaints, and even the possibility that Airbnb might soon require its community to pay an occupancy tax (the city tax you're required to pay at a hotel; a similar battle over this tax is happening in San Francisco). Chesky even highlights some of the 15,000 New York City hosts, people who are "at the median income level... more than half of them depend on Airbnb to help them stay in their home:"
They include hosts like Teya, a student who loves cooking for her guests and will use the money she has earned on Airbnb to buy her apartment in Harlem. Or Javier from Brooklyn, who works in the restaurant business and likes to show off his favorite Latin dance spots to travelers from every corner of the globe. And hosts like Lauren and her husband who are using the money they earn on Airbnb to pay off their student loans. Chesky's swift response isn't surprising. The company has always acted quickly in the face of conflict, adding liability insurance after a nightmarish situation where a woman's house was robbed and ransacked, for example, and more recently, a new verification process. 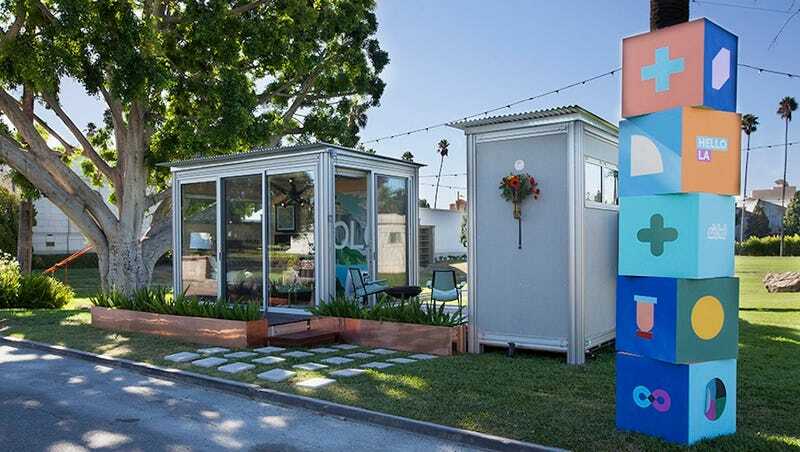 This pop-up home co-designed by James Franco was part of a massive citywide campaign helping Airbnb gain traction in L.A.
Last week in L.A., Airbnb was engaged in a massive lifestyle campaign called Hello LA, holding events at five pop-up "experiences"—essentially tricked out prefab houses—in five different neighborhoods, in partnership with celebrities like James Franco (who designed his YOLO house for a cemetery), Moby, and Anjelica Huston. Airbnb coordinated splashy workshops and concerts, and one lucky contest winner got to sleep in Franco's YOLO love den (I assume he wasn't there...?). I couldn't help but notice how far this Airbnb seemed to be from that "Who we are" manifesto. Where were those people trying to pay their mortgages and get through school? Celebrities!!! Earlier this year, my friend Anya Kamenetz eloquently dissected the real issue facing Airbnb in her Fast Company story "Is Airbnb Actually Good for New York?" She determined that, yes, Airbnb might be good for a city because it might allow a visitor to stay longer, spend more tourism dollars and spread those dollars around to residential neighborhoods that don't usually see the cash. Guests can also have more personal, authentic interactions with that neighborhood and its residents, which is a better experience for everyone. But she also highlights what she calls the "spring breakers effect." When your neighbors rent their place too much, or are phantom homeowners who use their property strictly for short-term rentals, it increases the chances that you'll have someone puking off the balcony above yours on a Saturday night. I'm not saying it will always be the case, but it definitely makes it more likely. In New York City, Airbnb claims 87 percent of its users rent the houses in which they live. The other 13 percent are probably those phantom homeowners. These are "people" like Skyline Luxury Rentals (they didn't even try to use real names!) that use Airbnb to list their McMansions out here in California. It's obvious that Airbnb desperately wants a slice of that high-end rental service—growing its list of architecturally significant buildings, offering professional photography for hosts, introducing a Pinterest-y Wish List feature, holding those splashy concerts at the Viper Room. But it's those kinds of rentals are entirely different entities when it comes to the renter, the city, and most importantly, the neighbors. Airbnb should fight to allow people to rent their homes and figure out a way to do it that's fair to both the homeowner and the city (this will be sticky, as occupancy taxes vary so widely from city to city). But the 13 percent of non-resident hosts? They should absolutely be paying that minimum occupancy tax—and maybe more. What I'd really like to see is a way for Airbnb to take that data that the New York State attorney general wants and use it to filter out, or at least separate, the 13 percent—maybe call it Airbnb Pro—to get Airbnb back to what it was originally all about. Airbnb is doing many things right. But the best thing they've ever done, in my opinion, is a simple social feature: When you log in with Facebook, you'll see who of your friends is friends with any Airbnb host, a quick and easy way to validate the person and the property. That tiny detail, I feel, is closest to the "heart and soul" of the original vision that Gebbia and Chesky had for the company when I wrote about them six years ago: real people renting their actual homes to other real people. Top image and YOLO house image courtesy Airbnb.